In addition to restoring single files from selected restore points, Veeam Backup Enterprise Manager supports bulk restore. If you need to restore multiple files at once, you can select more than one file in the preview pane when browsing, and then use the Restore command, or add the necessary files to the restore list and then restore all files at once. Unlike the Restore command, using the restore list helps you to prepare for restore files from different machines, backups and restore points. 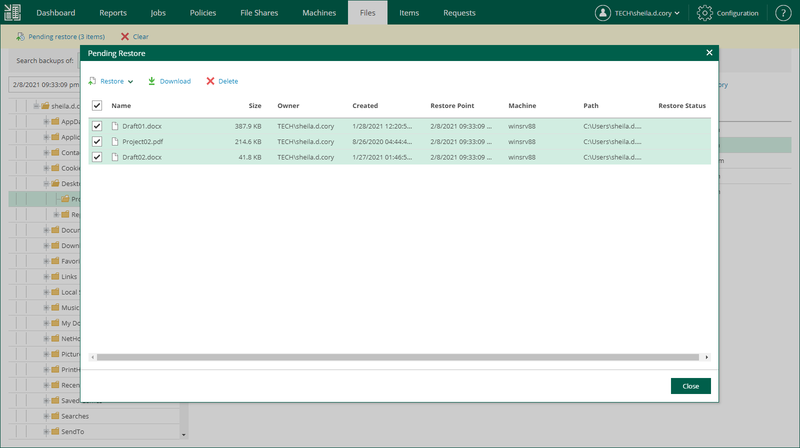 Locate the necessary file using browse or search possibilities of Veeam Backup Enterprise Manager. For more information, see Browsing Machine Backups for Guest OS Files or Searching Machine Backups for Guest OS Files. Click the Add to restore list button, or use the file shortcut menu command. When a file is added to the restore list, the Pending Restore tab becomes available on the left. Veeam Backup Enterprise Manager keeps files in the restore list until you leave the Files section. When you switch to another section of the management website, the restore list is cleared. Select the necessary files from the restore list and use the Restore or Download buttons to perform the corresponding restore operation for all selected files. You can remove selected files from the list using the Remove selected link at the top-right of the list. Use the Select all and Clear all links to facilitate the file selection process. Click the View History link in the bottom right corner. Select the necessary restore operation. Open the Log tab and click Download.